Here we have a selection of reviews about the novel “The Christian Kamikaze” and all the news about the book. From the index proceed to consultation by clicking on the name of the newspaper/magazine. 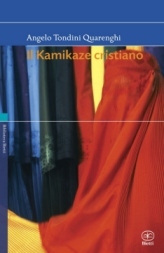 una recensione del volume "Il Kamikaze cristiano". Per vedere il filmato, click sull'immagine. Libreria Universitaria, il giorno 2/12/2006 ha pubblicato una recensione del volume "Il Kamikaze cristiano". Per vederla, click sull'immagine.